Foreign Service Pension, Grandparent vs. father in custody dispute, Overtime pay and child support, Removal case, Length of marriage for alimony purposes where parties remarry each other, Imputing income to former cancer patient and more. The 35th Annual Family Law Workshop will be held from August 4 though 6, 2016 at the Stone Harbor Resort & Conference Center in Sturgeon Bay. Once again, I’ll be co-presenting the Case Law Update portion on Saturday morning. For more information, visit the workshop Web site. The 2016 DCI Seminar will be on November 11, 2016 at the Delafield Hotel. This year, I will be co-presenting on “The Cooperative Trial”. For more information, visit the DCI Web site. On June 7, 2016, the District I Court of Appeals issued their opinion in Simon v. Wilson, No. 2015AP1769, which affirmed in part; reversed in part and cause remanded with directions the order rendered by the Honorable William Sosnay (Milwaukee County). Jackson Simon brought two separate paternity acknowledgment actions that were later consolidated. In his suit, he sought determination of child custody and placement, child support, and other issues not relevant to this appeal. The legal actions were commenced following the separation of Wilson and Simon when Simon was charged with disorderly conduct-domestic violence. A trial took place in this matter. The trial court ordered joint custody with primary placement with Simon. Wilson appealed. 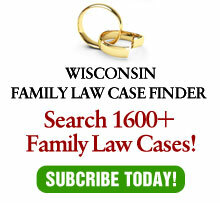 Wilson first argues that the trial court erroneously exercised its discretion when it entered a joint legal custody order because the trial court failed to apply the rebuttable presumption found in Wis. Stat. 767.41(2)(d)1. In order to invoke the presumption, the statute requires that a party has engaged in a pattern or serious incident of interspousal battery. Here, the trial court acknowledged the conviction of disorderly conduct-domestic violence, but did not consider the other instances related by Wilson as a pattern. Rather, the trial court characterized their collective conduct as arguments resulting from their immaturity. As a result, the trial court properly exercised its discretion in awarding the parties joint custody. Next, Wilson argues that the trial court erroneously exercised its discretion when it granted primary placement to Simon because by doing so, the trial court reversed a long-standing physical placement arrangement which would not have been necessary had the trial court properly followed 767.41(2)(d)1 rebuttable presumption directive. Here, the trial court properly determined that the rebuttable presumption found in Wis. Stat. 767.41(2)(d)1 did not apply to the circumstances present. Further, in determining that the children’s best interest was served by awarding Simon primary placement, the trial court discussed the factors found in Wis. Stat. 767.41(5). Therefore, the trial court properly exercised its discretion when it granted primary placement to Simon. Finally, Wilson contends that the trial court erroneously exercised its discretion when it prohibited her from consuming alcohol during her placement and also prohibited her from possessing firearms or weapons. One of the factors that a trial court is to consider in custody and placement determinations is whether either party has or had a significant problem with drug or alcohol abuse. Here, the record reflects that Wilson’s chronic illness calls for her use of medication that can cause mood disorders. The fact that alcohol can alter moods is well known and therefore it appears imminently reasonable for the trial court to prohibit the consummation of alcohol during her periods of placement. However, there is no evidence in the record that supports a condition that neither party possess firearms or weapons. Consequently, the order prohibiting Wilson from possessing firearms or weapons was reversed. On June 21, 2016, the District I Court of Appeals issued their opinion in Ehlinger v. Galindez, No. 2015AP1428, which affirmed the order rendered by the Honorable Maxine A. White (Milwaukee County). On June 19, 2014, the circuit court entered a final order on placement and support for the parties’ two children in a paternity action. The provision in the final order relevant to this action concerns variable costs and out-of-pocket medical expenses, and it states that they shall be split 50/50 and payment made within 30 days of notice and receipts for obligations included in the statutory definitions. On November 25, 2014, Ehlinger moved pro se for a finding of contempt based on Galindez’s alleged failure to pay his share of the variable costs, including out-of-pocket medical expenses and child care expenses as ordered. On June 26, 2015, the court entered an order denying Ehlinger’s motion to hold Galindez in contempt and her request for reimbursement of claimed expenses. Ehlinger appealed. Ehlinger argued that the circuit court erred when it concluded that the evidence did not support a finding that Galindez was in contempt. In rejecting contempt, the trial court made specific fact findings about the deficiency of Ehlinger’s evidence. Here, the trial court found that the receipts attached to Ehlinger’s summary exhibit did not credibly establish the debt or payment claimed. The trial court also found that there was no credible record of many of Ehlinger’s expenses claimed from purportedly relative vendors, no record of communicating her plans to make a debt within a reasonable period of time and no record that a timely request for payment was made. The final order mentioned no definition of variable costs and no explanation of the process for notice and reimbursement. Thus, the trial court properly considered a reasonable process and found Ehlinger’s actions and proof unreasonable and therefore did not hold Galindez in contempt. The trial court erred by interpreting 22 U.S.C. § 4054(a) to require that a valid waiver of spousal rights make specific reference to a Foreign Service pension. Rather, an unambiguous waiver of all pension, annuity, and survivor benefits suffices under section 4054(a). The legitimate interests of Foreign Service spouses will not be undermined by enforcing unambiguous waivers that specifically refer to all pension, annuity, and survivor benefits. After mother’s drug overdose, maternal grandmother filed petition for custody of children. Unwed father counterclaimed for custody. The Superior Court awarded custody to grandmother and denied father’s motion for new trial. Father appealed. Held: The trial court was required, prior to awarding custody of children to maternal grandmother, to determine that children would suffer physical or emotional harm if custody was awarded to father, and not merely that the harm might result. Evidence supported calculation of father’s child support obligation based on father’s actual earnings, including overtime pay, in mother’s action to modify father’s child support obligation contained in parties’ stipulated final parenting plan and property settlement agreement, though father asserted that he would no longer be earning overtime wages; father presented no evidence, other than his own testimony, to support claim that his employer intended to eliminate all overtime opportunities, and evidence was presented that father twice stated in the past that he would no longer have overtime opportunities, yet he continued to earn substantial overtime pay subsequent to both such announcements. Purported husband and wife were validly married in bedside ceremony presided over by ordained minister on day before husband’s death intestate, despite fact that ceremony was conducted without a marriage license and that minister intended to perform a religious ceremony but not a legal ceremony; marriage was conducted in accordance with statute, absence of valid license did not invalidate the marriage, and minister’s intent was irrelevant. Removal of child from Massachusetts to Florida would provide real advantage to father, who had primary physical custody of child, as required for father to show cause for removal, despite evidence that father had just purchased home in Massachusetts immediately prior to requesting removal; father’s income from law offices in both Florida and Massachusetts had decreased since he gained custody of child, thus, he would benefit financially from lower cost of living in Florida, father had large family base in Florida who could provide emotional and physical support in of child, while he had only one cousin who lived in Massachusetts, and father’s purchase of home in Massachusetts just before request was not reflective of ulterior motive on father’s part to deprive mother of visitation. In second divorce action involving same parties, husband appealed determination of the trial court that the length of the parties’ marriage for purposes of calculating the durational limits of a general term alimony award to wife was the period from the date of the parties’ first marriage through the date that husband was served with the complaint in the second divorce. The Supreme Judicial Court held: (1) a trial judge, when determining for purposes of calculating alimony whether to increase the length of a marriage based on a period of cohabitation and an “economic marital partnership” prior to the marriage, must consider the statutory factors applicable to ascertaining whether, for purposes of terminating, reducing, or suspending an alimony award, a former spouse is maintaining a “common household” with another; (2) trial judge did not abuse his discretion in determining that period of cohabitation before parties’ second marriage was an economic marital partnership; and (3) length of parties’ first marriage was properly considered in determining overall length of marriage; but (4) trial court improperly included 50-month period during which parties neither were legally married nor engaged in an economic marital partnership in determining length of marriage. Evidence was sufficient to support trial court’s determination in divorce proceeding that wife, who had received treatment for cancer that was in remission, was able to work 40 hours per week at $10 per hour, for purposes of imputing income for alimony and child support awards; wife had stamina to be involved with children’s activities, including college visits and attending their frequent sporting events, wife had college degree, and there was no medical evidence supporting claim that wife’s health precluded her from working. The term “postsecondary,” as used in child support statute provision permitting an award for postsecondary educational expenses of an adult child, does not include graduate or professional school expenses.